Score a touchdown with these crowd favorite Super Bowl snacks. Whether you're tailgating before the big game or having friends over to gather 'round the big screen, these snacks are perfect for your party. Football season calls for warming, homey, snacks, and meals you can eat without gathering at the table. We've got just the ticket. These party snacks, finger foods, dips and spreads, chilis, desserts, and more will ensure your get together wins the day, regardless of whether your team does. Now all you're missing is a good beer or cocktail. You've probably ordered these fried jalapeño poppers at a restaurant, but have you ever considered making your own? They're a lot easier than you might think, and you can either fry or bake them depending on your preference. They can also be made ahead—just freeze after assembling, then drop into oil when you're ready to serve. Wings in the slow cooker? You bet! These awesome garlic and ginger wings come together with a sticky, Asian-accented sauce that would also taste great on top of a stir fry or a dipping sauce if you come up with extra. It's practically hands off, so you'll have plenty of time to bring together the rest of your dishes. If you like spicier wings, add a little hot sauce or sambal, to taste. Put together these miniature Italian meatball sliders for a snack-sized version of everyone's favorite football-watching sandwich. Scale up this recipe for as many sandwiches as you need, to feed a small group or a whole party. They're easy enough to assemble, so you can also set out ingredients and let your guests customize their own as the game goes on. Bacon and cheddar are a match made in football heaven and these easy chicken strips are made for munching during the big game. They're baked instead of fried, making them a teeny bit healthier, and you can size up the recipe to suit a big crowd. Serve them with a simple Sriracha mayo for top-notch dipping. This classic Tex-Mex Frito pie is just as delicious today as it was when you were a kid, and it will delight kids of all ages. To really elevate it, use a homemade chili that you simmer on the stove, but you can also just mix up ground beef and a packet of taco seasoning if you're short on time. Your guests will love the spicy, crunchy, meaty combo. How about a chili bar for your Super Bowl get together? This chicken chili will surprise guests who are expecting the standard red meat version, and you can even make both to give your friends a choice. It's especially delicious with a side of cornbread or muffins, and a dollop of fresh creme fraiche. These Tex-Mex taco beef sliders are easy to prepare and assemble and since the meat stays warm in the slow cooker, guests can easily help themselves throughout the game. If you want to save even more time, purchase pre-cooked shredded beef or pork instead of making your own. To level it up just a bit, put out mini sandwich buns instead of dinner rolls. These succulent teriyaki meatballs combine your favorite takeout flavors with a snackable shape and they're simple to toss together for the big game. You can also adapt the recipe for a delicious lunch or dinner or as an appetizer for a fancy meal. Everyone will be asking for the recipe by halftime. Packed with the familiar flavors of pizza, this Stromboli is just like delivery in a rolled-up baked package. Stromboli is made with sauce baked into the bread, unlike calzone, which comes with sauce on the side. And because it can be eaten either hot or cold, stromboli is the perfect dish to bring if you're headed to a Super Bowl get-together instead of hosting one. Bring a Mediterranean twist to the party with this healthy and easy hummus. The popular spread is simple to make at home, and you can serve it with celery and carrot sticks, chips, or pita triangles for a pretty and un-fried snack. Add mix-ins like chopped kalamata olives, roasted red pepper, or extra garlic for some fun flare. Find tahini in the international section of your grocery store. Following a low-carb or ketogenic diet? You don't have to miss out on all the fun! This easy cauliflower and lentil pizza crust will make a pie with toasty edges. Top it with your favorite pizza fixings for a simple appetizer that anyone can eat, even if they're avoiding carbs. Use canned, fresh, or even imitation crab meat for this easy, creamy dip. Mayonnaise and cream cheese give it that luscious, spreadable texture and it goes great with Ritz crackers, veggies, or chips. It's a unique addition to your Super Bowl spread, but you'll definitely want to save the recipe to use as a party appetizer any time. If you didn't serve Chex Mix, did you even have a Super Bowl party? This is the recipe you might remember from childhood, taken right off the 1950s Chex cereal box. It tastes just as great as it always did and your guests will enjoy it by the handful. Omit the peanuts if you're not a fan, and feel free to use pretzel twists instead of rods if that's what you have on hand. With all of the meat, cheese, and fried snacks, you're going to need a veggie side dish. But don't worry, this one feels anything but virtuous. Try Mexican street corn or elote. It's slathered in mayonnaise and sour cream, then studded with cotija or queso fresco, a crumbly Spanish cheese. If you can't find those, feta will work just fine. Sometimes, you just can't decide between tacos or pizza. With this easy homemade taco pizza, you don't have to! This pie uses the refrigerated crescent dough for quick and simple assembly, and you're free to mix up the toppings. Ground turkey makes a great substitute for beef and lights sour cream and cream cheese will shave down the calories without sacrificing taste. Serve with lime wedges for squeezing and guacamole for dolloping on top for real taco flavor. Many of us have strong opinions about chili. Some like it meaty, some like beans and other veggies, and some won't go near the green stuff. This meaty chili will win over every guest, regardless of preference. Serve with some sour cream, chopped chives and green onions, and some extra hot sauce on the side for garnishing. If you live in the South, you may already know all about the popular Rotel and cheese dip. This addictive slow-cooker version can be served right from the crockpot and it really couldn't be simpler. It's a cheesy, hearty dip that goes well with chips or crackers or even a variety for a fun platter. Use Hawaiian or other prepared dinner rolls for these cute little sandwiches. They're cheesy, meaty, and great for a crowd. The recipe calls for yellow mustard, but whole-grain or Dijon would also taste great. Use either cheddar or Swiss cheese, and don't skimp on the ham. 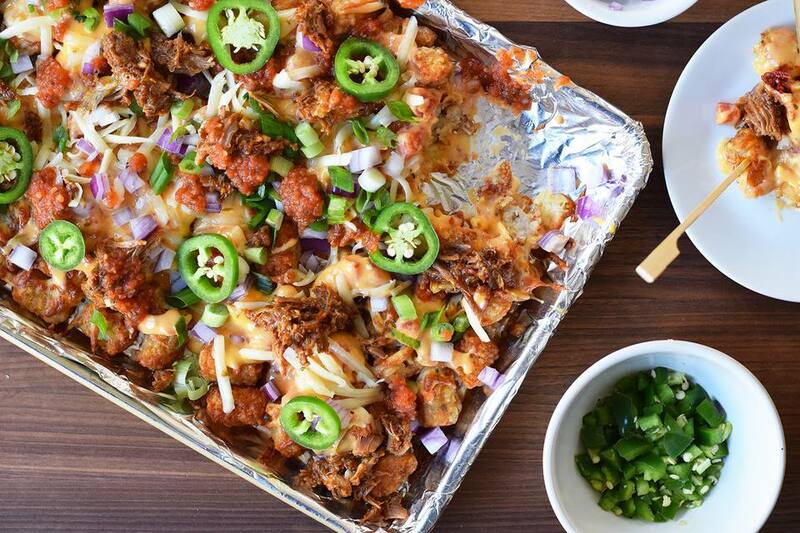 We all love nachos and you've probably wolfed down a tater tot (or five). Why not combine them and make totchos, the best Super Bowl snack this side of the 49-yard line? Just lay down a layer of tots and smother them in queso, taco meat, lots of shredded cheese, salsa, and whatever toppings your little heart desires. This versatile, hearty recipe is endlessly customizable, so let your imagination be your guide. But you might want to make extra—they're sure to be a touchdown. Once you try homemade guacamole, you'll never buy another jar again. This version uses just a few ingredients and it's completely customizable. Include some jalapenos, for example, if you like spice, but taste the guac as you add—it can get spicy quickly! Serve with your favorite tortilla chips for scooping. Try these finger-lickin' good slow cooker chicken drumsticks as a tasty alternative to purchased wings. The simple sauce uses ingredients you've probably got on hand and it's so flavorful, both adults and kids will love it. Best of all, they're made in the slow cooker, so you can set 'em and forget 'em while you prepare the rest of your spread. You'll probably have a cooler full of cold ones on hand to go with the game, but why not bake beer right into your snacks? This basic beer bread recipe forms a yeasty loaf that will make great sandwiches, or you can tear it into chunks for dipping, or even serve it with butter for a simple snacker. A fresh pico de gallo salsa paired with tortilla chips to keep the crowd munching their way through the game. Making your own is super simple and it has a zesty, assertive flavor that's much more exciting than the jarred kind. Serve it with blue tortilla chips for a pretty contrast. All you need for these addictive deep-fried ravioli is a container of pre-made pasta and some dredging ingredients, plus some warmed marinara for dipping. Use four-cheese ravioli for the best flavor, since the regular cheese kind don't have quite enough flavor. You can assemble ahead of time and store in the fridge until you're ready to fry up a batch. If you use the frozen kind, make sure to defrost them entirely before breading and frying. What's even better than cracking open a cold beer? Combining it with cheese and slurping it up as a soup, of course! This hearty soup will warm you right up on a cold winter day and it's filling enough to hold you through the whole event. Spice it up a little by adding bacon, hot sauce, or chorizo and serve it in a bread bowl for extra flare. If you like spicy, zesty Buffalo wings, you'll love the Bayou flavors of these spicy Cajun-style wings. Make them in your oven for less mess than frying. They do need to marinade for four hours, so prep accordingly—and make sure you use a non-reactive container like a plastic container, glass bowl, or zippered storage bag. Some people don't think beans belong in chili, but this meaty pot with black beans and a selection of both hot and sweet peppers might change your mind since it will warm you right up on a chilly day. Serve it out of a slow cooker or just a big pot on the stove with a "fixings bar" nearby with sour cream, chopped green onions or chives, extra hot sauce, and some cilantro. Potato skins are a classic, crowd-pleasing snack for a game day party. Best of all, these can be assembled ahead of time and refrigerated until you're ready to bake. To suit your tastes, you can mix up the toppings. This recipe also scales well, so make more if you've got a big group on the way. If you enjoy cheese crackers, try making these crispy cheese straws with a similar flavor. Use the best quality cheddar for the recipe, since it's really the star of the show. Add a little extra cayenne pepper for an even spicier cracker. 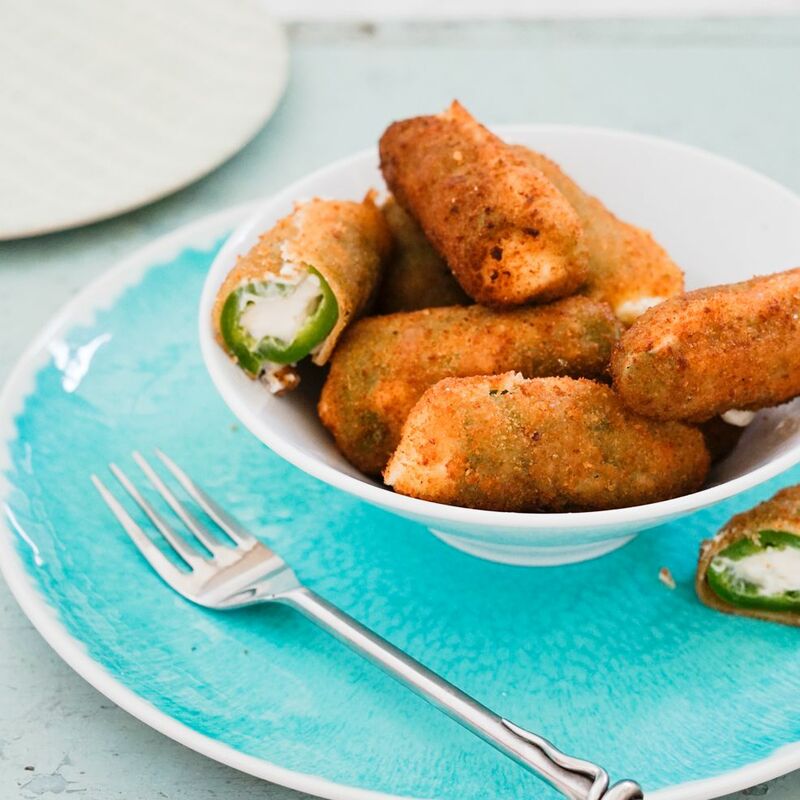 If you've got a taste for spice, these jalapeño poppers are just what the doctor ordered. They're also wrapped in bacon and smeared with cream cheese and apricot jam for a sweet, spicy, meaty combination that will make you forget about the sad frozen version. They don't keep, so pop them in the oven when your guests arrive and eat them right as they come out. These easy, crescent roll-wrapped appetizers are just as much fun for kids-at-heart as the little ones, so if you've got a family-friendly Super Bowl gathering, you'll want to serve these little guys. They're also very simple to put together—the kids can even help prep them for a fun, family activity. Got a gluten-free football fan in your group? Don't leave them out of the fun! These hearty macho nachos are made with gluten-free tortilla chips and the same cheese, beef, veggies, and toppings that make nachos the perfect Super Bowl snack. Layer the chips and toppings to avoid the dreaded naked chip at the bottom. You probably know the store-bought version that comes in a red box, but these homemade crackers have an even stronger cheesy flavor and they're not at all difficult to make. Use a blend of cheeses for the best results. Adding in some pepper jack will give them a zesty spice that will have everyone grabbing handfuls. Rather than ordering a whole pie, make these crescent roll pizza pinwheels for the same flavor. These use store-bought dough, pepperoni, and cheese, and you can mix up the other additions depending on your preference. Serve them with marinara or prepared pizza sauce for dipping and nobody will wonder why you didn't go for takeout. If you love tater tots, you have to try making your own. They're not as hard to whip up as you might think and make them at home means they're chock full of fresh shredded potatoes, spices, and nary a processed frankenfood in sight. The fried version tastes the most like the frozen kind, but you can also bake these. To serve a crowd, you can't beat hearty BBQ beef sandwiches that can be dished up right out of the slow cooker. The meat does need to cook for 7 to 9 hours, so put it together the night before so you're ready to go at kick-off. Serve them with a basket of rolls on the side, so guests can grab and go during the commercials. Throwing back a few cold ones? Toss one of your brews into these beer brats, for hearty sausages that go great with—you guessed it—a nice, cold pint. Bratwurst is the traditional sausage, but you can use any kind you like or mix it up with a few varieties. If you're an onion fan, double them. You can't have too many onions to toss on top of beer brats. Deconstruct the typical pizza with this gooey pepperoni pizza dip. Make sure to soften the cream cheese before adding for easier mixing. Using refrigerated pizza dough to make crusts for dipping will be a touchdown with your guests. No delivery tips required. Crowd-pleasing sloppy Joe sandwiches are perfect if you've got a big group on the way. It couldn't be easier to present since you can serve the meat mixture straight from the slow cooker and set out buns right next to the pot. Make sure to have plenty of napkins on hand; these puppies live up to their name. Nachos and football go together like fireworks on the Fourth of July, and this grilled sweet potato version makes a tasty twist that's even more exciting than the standard tortilla chips. If you don't have a grill, you can also make this recipe in the oven or on the stovetop. Cut the sweet potatoes fairly thin, so they get a slight crisp. Made with canned biscuits and chili, these handheld snacks are baked in muffin tins for chili biscuit cups that are easy to eat. You can use prepared chili or make your own for a homemade touch. If you've got leftover chili from a meal earlier in the week, this appetizer comes together in no time. It doesn't have to be torture to stick to a diet on game day. These crustless mini quiches are perfect for low-carb guests and they're chock full of veggies that make snacking guilt-free. They're also high in protein, so they'll keep you going through the last quarter. In a sea of meaty, cheesy, fried foods, following a vegan diet can be a challenge on Super Bowl Sunday. But this delicious and healthier vegan olive tapenade will add a nice contrasting flavor and an animal product-free option to your spread. Serve it with toasted bread rounds or crackers and feel free to make it ahead; it will keep in the fridge for a few days. Move over, Auntie Anne's. These soft golden pretzels are easy to bake up at home and they'll make your guests feel like they're at the stadium snack bar. You can knead them with the stand mixer dough hook attachment or by hand, but remember to sprinkle them with big rock salt for the best flavor. Make extras and freeze them for a future event, but make sure you let them cool completely before storing, so they don't get soggy. Stuffed mushrooms are a standard appetizer, but have you ever tried them with seafood? Minced clams and garlic add a really unique flavor to this variation, which will class up your get together. Don't be surprised if everyone asks for the recipe before the score is settled. Burgers and chili are all well and good, but how about adding some shrimp to your Super Bowl spread? These pan-fried shrimp cakes are crispy and succulent with just enough seafood flavor, and the Sriracha dipping sauce has plenty of spice to keep things interesting. You can make them larger to serve as sandwiches or smaller for finger foods. They can also be assembled and refrigerated ahead of time, so you can fry up a batch as needed. Head south of the border with this classic chile and cheese dip. It's best served hot, so use a chafing dish or a slow cooker to keep it warm and melty. You can adjust the level of heat by adding additional peppers, or serve a bowl of chopped peppers on the side so guests can add their own. All those bags of chips will be empty in no time. You can never have too many dips at a Super Bowl party. This five-ingredient bean dip couldn't be easier to throw together, so if you're not a cook and have to host, consider this your new go-to. Use mild salsa and chilis for a smooth, kid-friendly flavor, or kick it up a notch with cayenne peppers and hot salsa. Garnish with cilantro and a little green onion and serve with pita or tortilla chips. Grab a batch of wonton skins for these crispy, cheesy sausage stars. Drain the meat well and let it cool before wrapping it up, so they don't get too greasy. Make sure not to overfill the wontons or that would create a real mess. Whipping up pork-stuffed spring rolls at home isn't as hard as it sounds. This recipe makes a dozen or so crispy-skinned rolls that will add an Asian flair to the party. You may want to get extra ingredients to give yourself some practice, since getting the hang of wrapping the rolls can take a few tries. Don't get discouraged—it's all worth the effort!